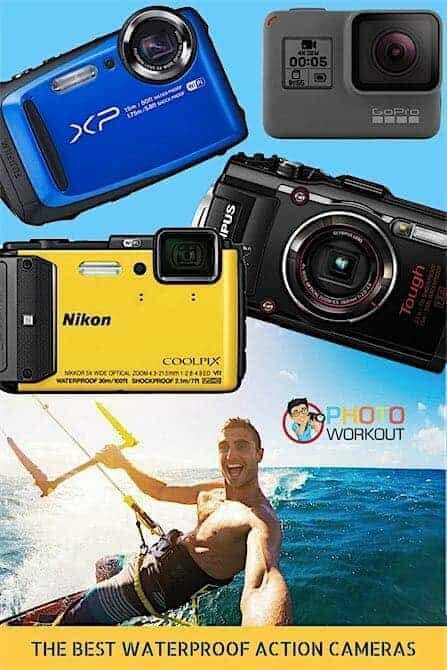 If your idea of the best waterproof compact sports cameras is something that literally goes everywhere you go, bounces back no matter what Mother Nature throws at it, emerge out of the water quite nonchalantly ready for the next assignment, then this round up of the best waterproof compact sports cameras is definitely for you. Today we look at the most rugged, the toughest, compact action cameras. The sort of cameras that quite literally are the embodiment of the go-getter attitude that distinguishes the true adventurer. The Best Waterproof Digital Cameras in 2017 Compared. First up is the camera that comes with a pretty envious pedigree. Designed to withstand underwater dives at up to 50’, survive a fall from up to 7’, and withstand temperatures of up to 14˚F as well as pressures of up to 220 lbf, the Tough TG-4 is one tough cookie. The only way to hammer this monster into submission is probably to put it literally under a sledgehammer or flip it overboard in the middle of the Atlantic. But don’t think this wolf underneath a sheepskin is designed for bad weather alone. It can demonstrate finesse when needed. Built around a 16 megapixel 1/2.3″ CMOS sensor the Tough TG-4 is capable of shooting full HD videos as well as capture RAW frames in a continuous burst of 5 fps. Image processing is powered by Olympus’ TruePic VII image processing engine. 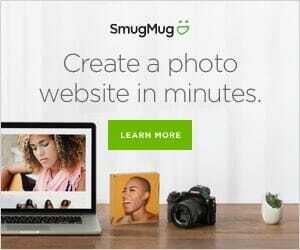 If that is not all, the tiny 4 – 18mm (35mm format equivalent of 25-100mm) f/2 – f/4.9 lens is capable of capturing a lot of light, even in the most difficult of lighting conditions. The normal minimum focusing distance is 3.9” which can be further stretched to 0.39” in super-macro mode. The engineers at Olympus have managed to fit in a sensor-shift type image stabilization system in the camera. It’s vitally important when using hand-held. Together with the macro mode and the fast wide lens the camera is capable of producing excellent images in most situations where other cameras fail miserably. The 3” rear LCD screen of the camera has a resolution of 460,000 pixels. The camera has built-in Wi-Fi and GPS capabilities as well a proprietary eCompass feature that gives you details of latitudinal and longitudinal position, atmospheric as well as water pressure, depth (or height as the case may be) plus time & date. The overall weight of the camera is 247 grams. All these at a price of under $380 (as on 29 October 2016). Truly, the Stylus TOUGH TG-4 is one camera you cannot go wrong with. See some sample photos at the DP Review Tough 4 Sample Gallery. 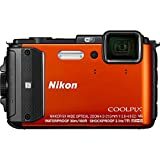 See more reviews and details of the Nikon-Coolpix-AW130 on Amazon. Everything that the Olympus Stylus TOUGH TG-4 can do the Nikon Coolpix AW130 can do better. The Coolpix AW130 is built around a similar 16 megapixel 1/2.3″ CMOS sensor as the Tough TG-4. But that is where the similarity ends. The Coolpix AW130 can survive dives to a depth of 100’, easily outsmarting the TG-4. It can survive temperatures as low as 14 ˚F as well as survive a fall from a height of 7’ (same as the TG-4). Apart from these, the Coolpix AW130 has built-in Wi-Fi, GPS and NFC capabilities. It is easy to set-up and to get started. Wi-Fi and NFC connectivity allows the seamless transfer of images and videos while GPS allows you to embed location data into the images as you shoot. One thing, though, all of these will hog a tremendous amount of power, especially GPS. So, unless you absolutely need these features keep them turned off to extend shooting time-frame. The lens on the Coolpix AW130 has a focal length coverage of 4.3mm to 21.5mm. That is the 35mm format equivalent of 24-120mm. Maximum aperture is f/2.8 at the wide end and f/4.9 at the tele-end. Compact camera lenses are extremely versatile. You can use the same lens to shoot great macro images with a minimum working distance, which in the case of the AW130 is 1cm. Whether it is shooting colorful coral fish underwater in poor light or small ferns on the forest floor in dark conditions, the Coolpix AW130 is capable of handling most situations with equal élan. Oh, and the camera has both optical as well as digital image stabilization. The Coolpix AW130 loses out to the TOUGH TG-4 in terms of RAW shooting. It can only shoot in JPEG. Having said that the Nikon has a better continuous shooting speed compared to the Olympus. 7 fps against 5 fps. So far as video is concerned the Coolpix AW130 can also shoot at full HD quality (1080p) at up to 60 fps and with stereo sound recording. The camera has an internal memory of about 473 MB. It means you can shoot images even if you forget your memory card at the hotel. The rear LCD screen has a resolution of 921,000 pixels and is 3” in size. It gives a frame coverage of 98%. How heavy is it? Well the Coolpix AW130 is lighter than the TOUGH TG-4. With the memory card and the battery inside the camera, the Coolpix AW130 is just 221 grams. Read more reviews and see pictures of the Fujifilm FinePix XP90 on Amazon. The most common sensor size among all compact cameras is the 1/2.3″ CMOS. Earlier compact and compact superzooms like the Nikon L120 used CCD sensors. These were power hungry. Now due to the advancement in CMOS technology, a majority of compact cameras use the CMOS variety. And so does the FinePix XP90. It is powered by a 16.4 megapixel 1/2.3″ CMOS sensor. Paired with the camera is a Fujinon lens with a focal length range of 5-25mm (35mm format equivalent of 28-140mm). Thus, the FinePix XP90 has the further zoom range out of the three cameras we have discussed so far. The maximum aperture of the lens is f/3.9 at wide angle and f/4.9 at the tele-end. Thus, the FinePix XP90 does lose out to both the previous two cameras on this list in terms of maximum aperture. It also loses out to the Coolpix AW130 in terms of macro capabilities. The FinePix XP90 can shoot at a minimum distance of only 9cm. Image stabilization is a much have for smaller compact cameras designed for outdoor work. The FinePix XP90, as per Fuji standards, has the sensor-shift type image stabilization system. But what is important is the environmental sealing on the camera. 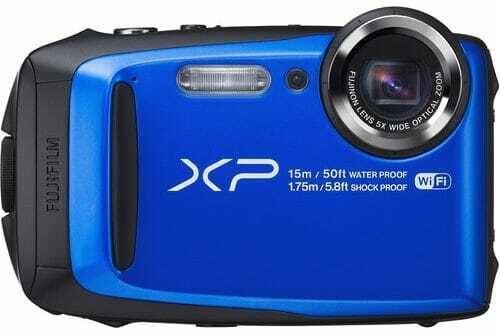 The FinePix XP90 is rated to work at temperatures of up to 14 ˚ F and up to a depth of 50’ of water. It can survive a drop from a height of 58’ and is dust proof to IP68 standards. Continuous shooting speed is a must have for outdoor, waterproof cameras. The FinePix XP90 is capable of shooting at up to 10 fps at full resolution for up to 10 frames. If you use a slightly smaller resolution of 3.1 megapixels you can shoot at 60 fps for up to 70 frames. The FinePix XP90 is capable of shooting videos as well in full HD 1080p resolution. However, the built-in mic can only record monaural sound. There’s an internal memory of 97MB which may not be suitable for recording videos but is good enough for making a few full-resolution JPEGs. The memory card is an absolute must. The back of the camera is dominated by a large 3” LCD screen with a resolution of 920,000 pixels and giving a frame coverage of 97%. How can you make a list of the best waterproof compact sports cameras without a GoPro on it? You can’t. The word GoPro defines what a rugged action camera should be. The name has been transformed into a verb. Such has been the popularity of this camera system. And that is why the GoPro is the next entry on this list. We have considered the latest GoPro Hero 5 Black for this. Sure GoPro is going through a difficult phase and they have been streamlining their product offerings, but still it is a name to reckon with. The GoPro Hero 5 is a built around a 12 megapixel CMOS sensor. It is not that much of a still camera than it is an action sports camera. It is designed to capture stunning videos of your adventurous side. It can capture 4K UHD resolution (3840 x 2160p) clips at up to 30 fps. At a scaled down resolution of full HD (1920 x 1080p), the camera can record at up to a stunning 120 fps. Imagine how dramatic your videos will look when you play them back in normal 30 fps or even the cinematic 24 fps frame rate? The GoPro Hero 5 is perfect for those sort of things. Oh, and you also get to record stereo sound along with the clips. Coming to still capture, the GoPro Hero 5 is capable of capturing both JPEG and RAW frames of 12-megapixel size. Image stabilization on the GoPro is digital. This is one those things where the GoPro loses out to something like the Fujifilm FinePix XP90 and the Olympus Stylus TOUGH TG-4. On the back of the camera is a small 2” LCD display with touchscreen properties. The Hero 5 and for that matter, any of the other GoPro cameras are not known for their LCD screen size. Recently, a group drove their car for several miles having forgotten an expensive DSLR on their car roof. Interestingly they were filming themselves with a GoPro but couldn’t make out the DSLR on the small screen of the camera. Weather sealing is an important attribute of the cameras that we are discussing here. 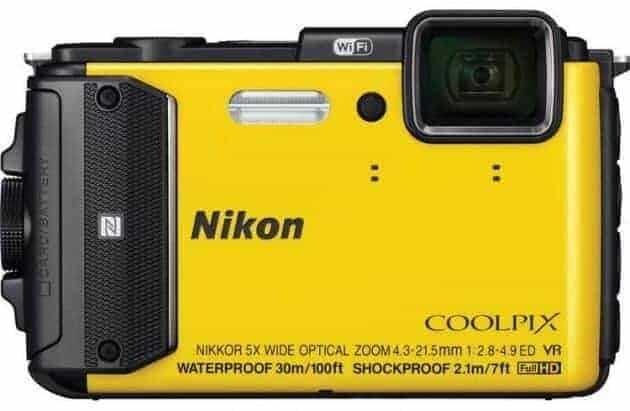 After all, this is a list of the best waterproof compact sports cameras. The GoPro Hero 5 is quite at ease underwater. It is waterproof up to a depth of 33’. The rubberized sealing on the camera can ward off dust, dirt, and the weather. The HERO5 comes with built-in Wi-Fi and Bluetooth connectivity. It also has built-in GPS. A first for GoPro cameras. However, all these is likely going to hog a lot of juice out of its batteries. But the true versatility of the GoPro Hero 5 is its adaptability to a wide variety of accessories and tools. GoPro makes a series of accessories themselves. But apart from that you also have a large number of third-party-made accessories for this very popular camera system. Thank you so much for such a detailed breakdown of all the waterproof and action cameras that are available. 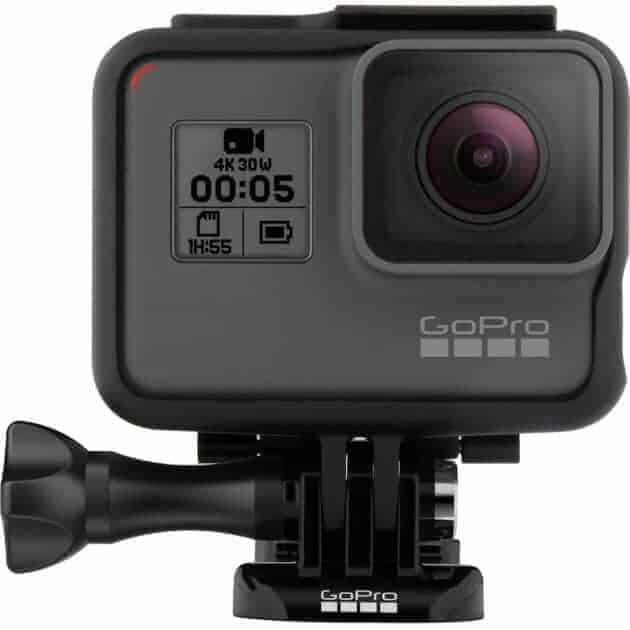 I have been struggling with choosing the right one and this post really helped me decide on the GoPro Hero 5 which I now own. I haven’t taken it in the water yet but have been impressed with it, especially taking wide angled shots.